The Saturday Paper launched in 2014 to much surprise. Editor Erik Jensen tells us all you need to know plus a little more. How is The Saturday Paper different from other weekend newspapers? It's better. Its focus is on long form writing, on telling the whole story. It's a newspaper of integrity. It serves only its readers - focused on big ideas, on writing, on hoping for a country that is better than it is sometimes given credit for being. We treat politics as more than spectacle, as something that matters and matters deeply. We treat culture as something vital, and find writers who can bring it to life. When we look for writers we draw not just from journalism, but from art and music and fiction. We always look for ways to make The Saturday Paper new and alive. What is the mix of coverage week to week? I like to think of The Saturday Paper as a distillation of the week. For many of our readers, it is the only paper they will read in a week. We break news, but we also spend a lot of time getting inside stories - telling the news behind the news. Our cultural coverage is for people who are willing to be inspired and who want to know more. Our commentary is really long form analysis. Our thinking is always about how we might better understand the world around us. How do you see The Saturday Paper's place in the Australian news media landscape? Very near the top. Actually, why not: right at the top. What is The Saturday Paper's relationship with The Monthly magazine? Is it a complementary one? Are they different in how news and current affairs are reported? It is bitter and divisive. The editor of The Monthly and I have been locked in a blood feud for at least three years, a kind of journalistic faida in which only one of us will survive. We spend our days glaring across at each other or else pacing the office like hunting dogs, the smell of resentment and distrust hot in our nostrils. 1. Who is the most inspiring person you've met and covered in The Saturday Paper? Why? As an editor, I am inspired by the writers who contribute each week to our pages - people like Kate Holden, Romy Ash, Maxine Beneba Clarke and David Marr, and regular contributors like Martin McKenzie-Murray, Mike Seccombe, Karen Middleton and Paul Bongiorno. We are always looking for subjects that inspire, which is no mean feat for a paper often focused on politics. 2. If you could name a story you are most proud of, what would it be and why? I am always proud to publish the writing of people held on Manus Island and Nauru, and am happy that these voices have become a regular part of The Saturday Paper's coverage. I also enjoy the stories we run that I believe would not likely run elsewhere. I think specifically of pieces such as Martin McKenzie-Murray's essay on child sexual abuse - an intellectually rigorous interrogation of evil that built from disclosures about his own abuse as a child. We are a paper focused on writing and this was a world class piece of prose. 3. 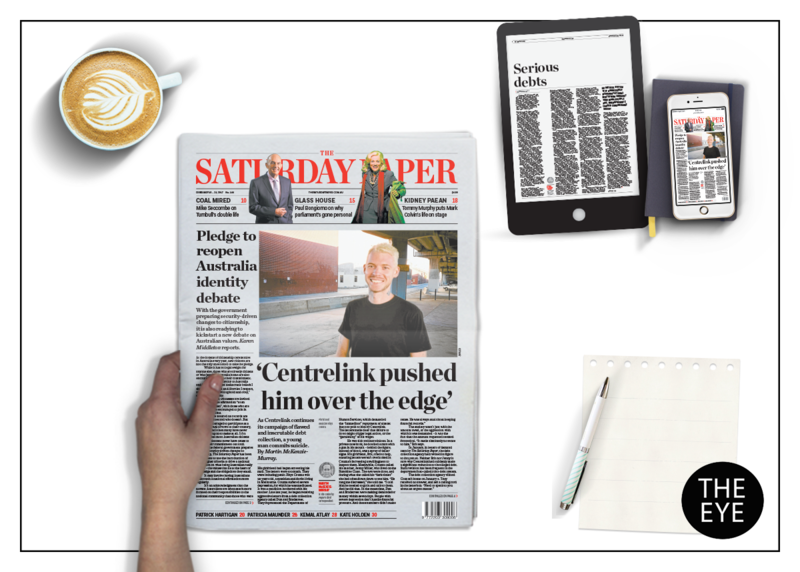 What do you enjoy most about editing The Saturday Paper? Probably Sunday. More seriously, it is a privilege to participate in the public debate of this country and in making the journalism we deserve. 4. What's the biggest challenge you face as editor of The Saturday Paper? My inbox. After that, myself. 5. Does it feel strange to be forging the path of a young newspaper in the digital age? We share our audience almost evenly across print and online, but I really enjoy the way having a print title makes all our journalism feel as if it has been handcrafted - edited three or four times, fitted to a page, then printed or loaded online, part of a history of care that runs through newspapers. It is good to slow down the news cycle and be conscious of making something permanent. Meet the editor of In the Moment, a brand new magazine dedicated to mindfulness, creativity and wellbeing.